According to its official press release, animeOnline was an "independent professional news resource, entertainment destination and online community for anime, manga and Japanese culture fans." Established as a "central location for fans of Japanese entertainment to get professional news, meet other fans and discuss the latest events." Backed by a team of dedicated editors, animeOnline experienced rapid growth and was poised to become the premier online anime community by successfully living up to its claims and seamlessly combining news, social networking and other informational resources into a single package. Fans could find the information they wanted, from the latest Lucky Star OP parodies to live convention reports streaming from Anime Expo, all reported in an unconventional but user friendly tone much like Kotaku and Joystiq. The future seemed bright but on July 20th, barely 6 months after its launch, animeOnline was shut down by its parent company Navarre. A single statement is all that remains on the main page, suggesting a possible site revival in the future. 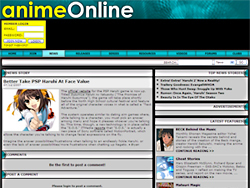 Many people, including animeOnline's own editorial staff, were left in the dark regarding the fate of the site. Many questions linger on unanswered. So what went on behind the scenes at animeOnline? How did the site start? What was it like working for the site during its short lifespan? And what led to its "temporary" demise? Read on as we dive into the interesting experiment combining anime and social networking known as animeOnline.